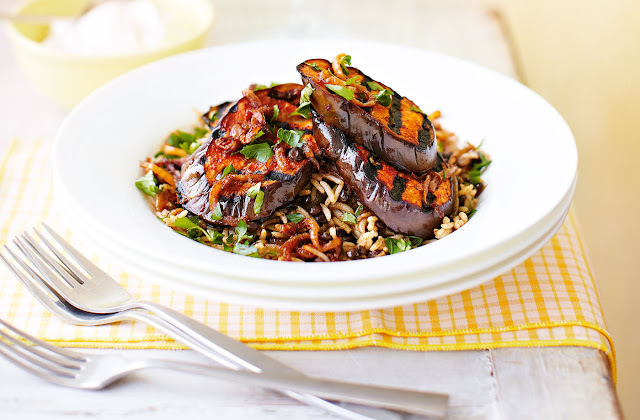 Take your tastebuds to the Middle East with subtly spiced rice and lentils teamed with chargrilled harissa aubergines, ready to eat in 40 minutes and perfect for vegetarians. In a frying pan, heat 1 tbsp of the oil. Add the onions and cook, over a medium heat, for 20 minutes, stirring until softened and golden. Add the butter 2 minutes before the end of the cooking time and, once it has melted, stir in the cumin and paprika and cook for 1 minute more. Remove a third of the onions from the pan and set aside. Add the rice and lentils to the pan with a good splash of water. Cover and cook for 2-3 minutes, then remove the lid and continue cooking for a further minute. Meanwhile, heat a griddle pan over a medium-high heat. Mix together the remaining oil and harissa, and then brush over the aubergine slices. Cook, in batches, for 2-3 minutes on each side, until tender and slightly charred. Divide the rice and lentil mixture between 4 bowls and top with the aubergine slices and reserved fried onions. Scatter over the parsley and serve with the seasoned yogurt for drizzling over, if you like.